One of side effects caused by the “K-Beauty” craze sweeping China and Southeast Asia is a war against fakes. Marketing campaigns to put up cosmetic brands even not existing at home as Korean businesses seem ordinary, and there are some who sell products after copying trademarks and container designs outright. According to the Korea Trade-Investment Promotion Agency (KOTRA), the number of civil and criminal cases in which offenders were caught for producing and selling cosmetics without the permission of trademark holders over the last five years reached about 1,500. How can Korean cosmetic makers resolve this problem? AmorePacific, Korea‘s top beauty product maker, appears ready to find a solution through blockchain technology. According to industry watchers, AmorePacific has let blockchain startup Block Odyssey take part in “AmorePacific TechUP,” its own startup nurturing project, since May. It is a project intended to discover and nurture startups that can contribute to AmorePacific’s beauty business and enable collaboration with its business models. The first class of the project began last year and its second class has been in operation since January. Selected teams are supposed to receive mentoring from AmorePacific and its startup accelerator Futureplay for six months. Funds, education and office space are offered too. Teams of the second class presented their six-month achievements at the cosmetic maker‘s Demo Day held July 24. 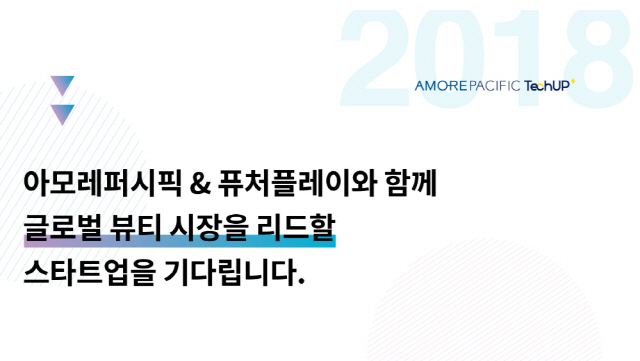 AmorePacific decides on its continuous investment and cooperation through subsequent evaluations. Launched in January, Block Odyssey joined the nurturing project in May when the second TechUP class was in full swing. “We are holding blockchain-related seminars at AmorePacific and various projects are now under discussion. We are mainly talking about genuine product authentication solutions based on a private blockchain,” Block Odyssey CEO Yeon Chang-hak said. The blockchain platform startup presented these solutions at the Demo Day. This technology envisions inserting a digital signature value into a quick response (QR) code pasted on the label of a cosmetic product and combining it with distribution information before verification through blockchain. Ordinary blockchain startups have opted for an outside URL having information instead of putting in information into the QR code directly. But Block Odyssey inserts an electronic signature used in blockchain into the QR code directly, according to the company. Noting that “a QR code can afford to contain only 0.003 megabytes, a capacity for only a few alphabetical letters,” Yeon said, adding that “That’s why other companies having tried to insert 3 to 5 MB into a QR code had to adopt the URL system.” That is to say, they were able to confirm distribution information by taking a detour with a URL because of failure to insert information into the QR code. “Our company has developed compression technology to insert an electronic signature into the QR code. This enables us to ensure security and integrity and prevent forgery and alteration by linking the QR code to blockchain,” he said. Like other Korean cosmetics companies, AmorePacific is grappling with forgery in the Chinese market. Chinese authorities have penalized those who produced and sold cosmetics that copied trademarks and designs of such AmorePacific brands as Sulwhasoo, Hera, Innisfree and Laneige in at least four criminal cases over the past two years. In April, AmorePacific won a trademark lawsuit against a Chinese company that mimicked Laneige.